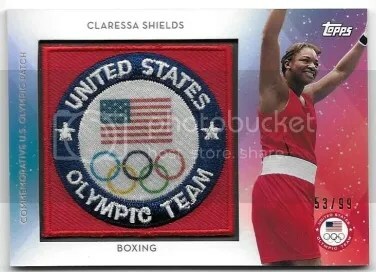 This contest is for a Claressa Shields 2016 Topps U.S. Olympic & Paralympic Team Hopefuls Relic. Good luck!!! This contest will end Friday, November 18, 2016 @ 8:00 p.m. EST. 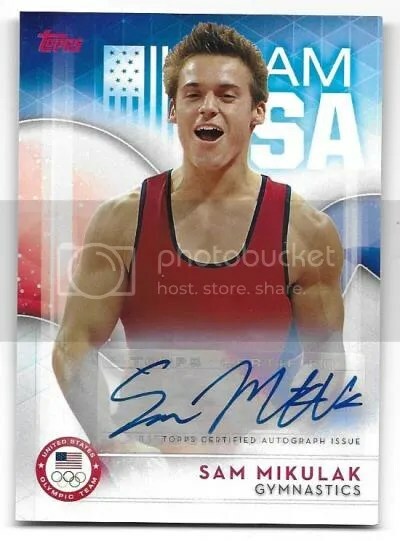 This contest is for a Sam Mikulak 2016 Topps U.S. Olympic & Paralympic Team Hopefuls Auto. Good luck!!! This contest will end Friday, September 16, 2016 @ 8:00 p.m. EST. The games in Rio may be over, but boxes of 2016 Topps U.S. Olympic & Paralympic Team Hopefuls will be around for a long time. Olympic products offer a fun alternative to the normal sports stuff we see on a regular basis. 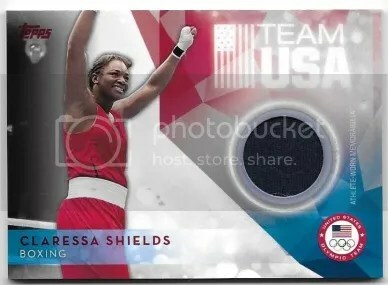 Most of these athletes, other than a few exceptions, will see their only cards show up in products such as this. Allen & Ginter is another place you can watch for them to popup. 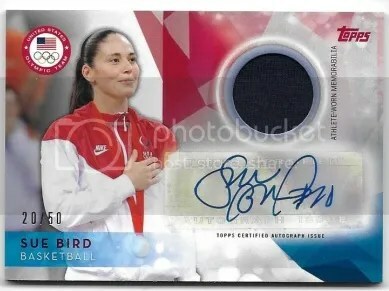 Olympic athletes have an insane collecting fan base, which you can see when looking at how much some collectors are willing to spend on their cards. If you’re a set collector, this product shouldn’t be that difficult to complete. The base set consists of only (74) cards. Parallels include Bronze, Silver, Gold, and Rainbow Foil. The Rainbow Foil parallels are the hardest to find given that they’re 1/1’s. Overall, the design is very simple. Out of all the sports represented, swimming and women’s basketball are the most dominant. Men’s basketball probably has the most recognizable names, but Topps isn’t allowed to make cards of them due to licensing with Panini. 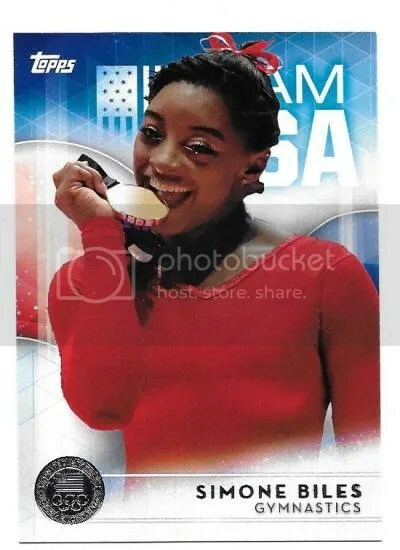 Topps made a great decision to include cards of Simone Biles. She lived up to the hype and performed very well. This is currently the only product you can find her cards in. They remain some of the most valuable “hits” you can pull. Even though he has had cards in other products, Michael Phelps continues to be the top dollar athlete you’d want to pull an autograph of. One of the best things about this product are the extra “hits”. Each box promises at least (3), but the odds are good that you’ll get more. A few things did run through my mind while opening this box. Where are Katie Ledecky and Usain Bolt? These two need to show up in a future product. Talk about two athletes that would drive attention to a brand. Another item I miss that Topps did before are the pin cards. The Olympics are big when it comes to pin collecting. Rarer pins can command some serious attention on the secondary market. 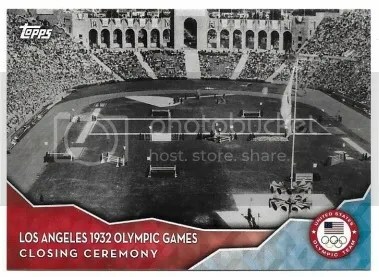 I’d like to see Topps bring back the pin cards for the next Olympics. When Topps has made pin cards in the past, those pins were specially made for that product. 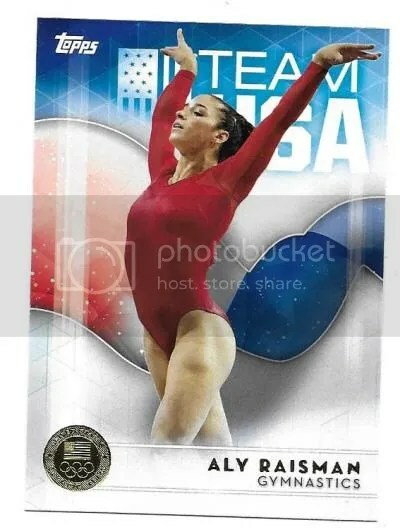 It would be really cool to see some of those rarer pins actually given out during the Olympics find their way into cards. If you’re looking for something different to break open, I’d highly advise giving 2016 Topps U.S. Olympic & Paralympic Team Hopefuls a shot.